Built by William Sweetland of Bath, the Gillingham Methodist Church organ was opened in June 1890 by Mr J.Macfarlane, FCO. By the late 20th century our instrument had started to show its age: indeed minutes of a Church Council Meeting held on 17 October 1983 outlined some of the problems that had become evident to the organist of that time during the preceding Winter. The Methodist Organ Advisory Service was therefore invited to examine the organ and to give recommendations on how to proceed. However, no further action was taken until November 2003 when the organ was re-inspected by the MOAS. It was apparent from their report that they considered it worthy of a full restoration. It was very, very dirty with many years of stone and masonry dust and even broken glass all over the sound boards and wind reservoirs! Dust and dirt had of course entered the pipes and affected their speech, especially the smaller ones. Many of the metal pipes had also suffered badly from 100+ years of cone tuning: indeed it was surprising that some of them sounded at all having been badly squashed! Much of the leatherwork had become desiccated and one of the organist's routine jobs was to replace the numerous leather buttons which formed part of the action and which broke with monotonous regularity! It certainly says something for the quality of Sweetland's workmanship that the organ continued to give good service for so long. The restoration was ultimately agreed by the Church Council and an appeal to raise the money needed for the work required was launched in June 2004. In late 2004, Michael Farley, Organ Builder of Budleigh Salterton was chosen to carry out the restoration and the work was finally begun in early January 2006. 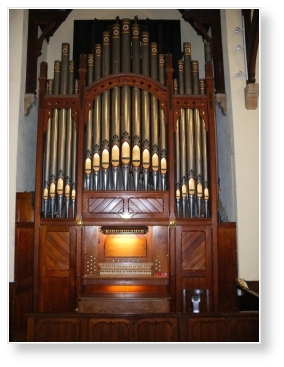 The church's organ committee agreed from the outset that there was some scope for sympathetic minor changes which could dramatically enhance the longevity and playability of the instrument. For example, the fitting of tuning slides to halt the damage to the pipes caused by cone tuning, replacing the existing badly-worn straight pedalboard with a standard radiating and concave pedalboard and installing a balanced Swell pedal to replace the existing hitch-down pedal. However, following a great deal of research and playing of a number of local organs, coupled with valuable advice from professional organists including Ian Tracey, we decided that the organ specification could be enhanced by adding further stops to the pedal division at relatively low cost. The decision was therefore made to add a full rank of half-length 16' pedal reeds to give a pedal Trombone stop and to extend the existing 16' Bourdon stop by 24 pipes to give 8' and 4' flute stops on the pedals. At a later date it also became apparent that a further rank of quieter pedal pipes would be beneficial, so a gentle 16' Echo Bourdon was also installed. All of these enhancements were performed without compromising the excellent tonal balance of the organ. We can now appreciate the high quality of the restoration work performed and it is fair to say that we are delighted with our reborn instrument.